Don’t be fooled: “wireless” doesn’t mean no wires. If you want a truly wireless security camera, the battery powered wireless security cameras will be your best solutions. Let me explain further: wireless security cameras refer to those transmitting data using wireless protocols (WiFi). But they still require a power source that is very dependent on wires. 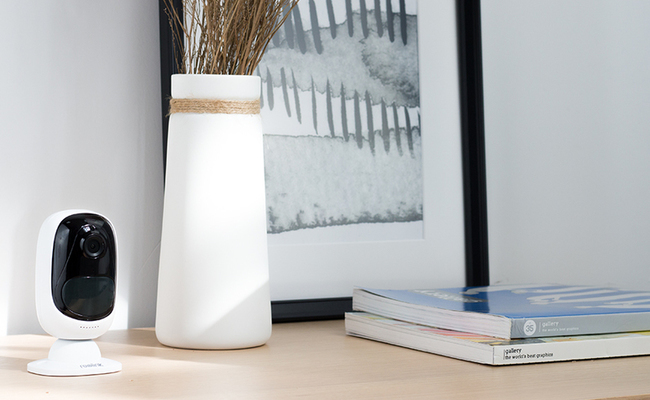 The battery powered wireless security camera systems, on the contrary, can stream data wirelessly and also don’t need power outlets – making them the complete wireless security cameras. Here we have summarized your common needs for the indoor and outdoor battery powered wireless security cameras, and you may skip to the part that suits you most. Since there are so many battery powered wireless security cameras sold in Amazon with the promise of “best home security solution”, it is important to find a customized one based on your actual need. then continue your reading to identify the best battery operated wireless security camera that serves your needs. In such cases, the battery powered outdoor wireless security cameras with memory card can be your handy solution. Click here to learn how to choose the best one. Though some features, such as remote viewing and instant alerts, will be sacrificed when there is no network, the battery powered wireless home security cameras with SD card can still work to monitor the place and record motion detection events onboard. And that means you won’t miss anything: You can take out the memory card of the wireless security camera with battery backup at your convenience, and then play back the footage on your computer to check what happened without your notice. Or if you want to watch live feed remotely without WiFi connection in the monitoring place, the cellular battery powered wireless security cameras, like Reolink Go can best meet your security needs, free from the limitation of WiFi network and power. Indeed, some top security camera brands, such as Reolink, would provide free and customized apps, through which you can easily access the outdoor battery powered wireless IP security camera from your Android phones or iPhones. And in case you want to identify some details when watching the live viewing, choose the battery powered 1080p Full HD wireless security cameras that can produce clear videos and also won’t eat up much of the bandwidth. Click here to learn all you need to know about it. 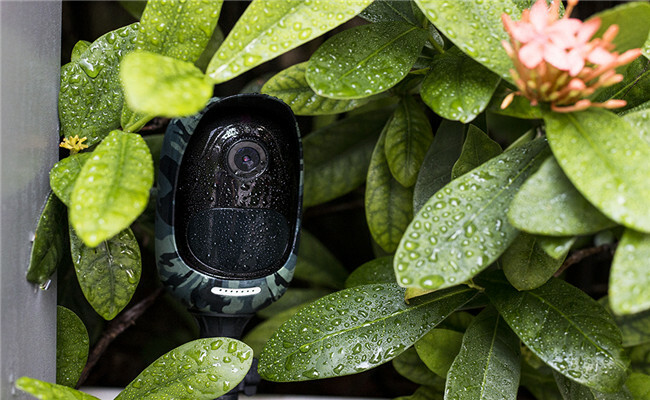 Taking the wireless security camera with rechargeable battery Reolink Argus® 2 for example, it features 1080p high resolutions and starlight night vision, enabling you to pinpoint single details both day and night. Below is the color night vision image shared by a user of Reolink Argus® 2. Whether you want to catch the car vandals, thieves, or your neighbor’s naughty kids who trespass your property red-handed, getting in-time notifications is the key. So the battery powered wireless security cameras you choose should embody smart PIR motion sensors and intelligent alerts (emails, push notifications, etc. ), so you can take responsive actions after you know something goes wrong. Siren alarms of the battery wireless security camera systems are even better – they can serve as the powerful deterrents to scare the unwanted away. For the truly wireless security cameras featuring easy installation and relocation, the best recommendations for you are the standalone wireless battery powered security cameras that can work independently without DVRs/NVRs, monitors or base stations. Just power the all-in-one wireless battery powered WiFi enabled security cameras and they can work in almost whichever places you like – no messy cables, no drilling holes, and no extra installation fees. If you need a surveillance camera for your rented house, the self-contained battery powered wireless security cameras would be the best and affordable options. And you can take away the camera when you need to move. Before you install a covert battery powered wireless CCTV security camera to spy on someone in your home, the first thing is to figure out whether it is legal in your place. If allowed, choose the low-profile battery operated wireless security cameras with compact designs and hide the security cameras in inconspicuous locations. And you may have more diverse needs to put up a battery powered wireless outdoor/indoor security camera systems. For example, if you want an outdoor battery powered wireless security camera that can survive under harsh weather conditions, the IP rating (should be IP65) and working temperatures are the factors you should consider. Continue to learn more about this battery powered camera type with this post. Or in case you want to keep in touch with your pet or children while away, the battery powered wireless security cameras with two-way audio, like Reolink Argus® 2 will serve you fine. 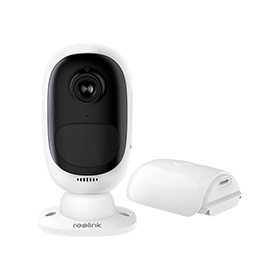 Based on the battery powered wireless outdoor security camera reviews, here we pick up the best battery powered wireless security cameras – Reolink Argus® 2 and Reolink Go, both can meet more than the needs listed above. Following the huge success of the battery powered wireless security camera Reolink Argus®, Reolink has now released the wireless security camera with rechargeable battery – Reolink Argus® 2. As the second generation of Reolink Argus®, Reolink Argus® 2 possesses all the features of its predecessor, like 1080p high resolution, smart motion detection, intelligent alerts, weatherproof design, etc. What make this outdoor battery powered wireless security camera stand out among other competitors is its starlight night vision and flexible powering options (comes with a rechargeable battery and allows you to add a separate solar panel). So you can expect to get clearer images and more visual details from this rechargeable battery operated wireless security camera at night (up to 33ft). Also, you no longer need to worry about the short battery life or the high cost to change batteries frequently. With the optional solar panel, you no longer need to worry about the short battery life of this wireless security camera or the high cost to change batteries frequently. Below is a video shared by a user of Reolink Argus® 2. 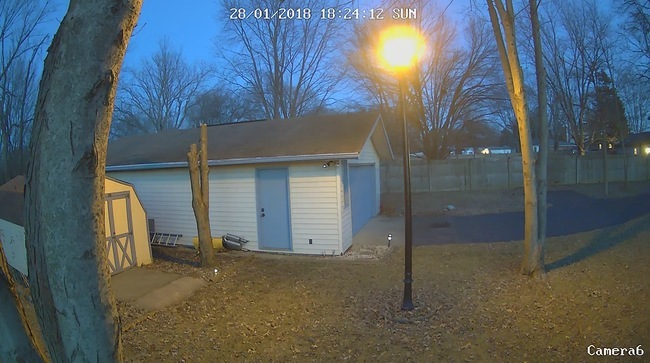 Can’t Miss: Reolink recently added a new solar security camera to the Argus family – Reolink Argus® Pro, which shares almost all the highlights of Reolink Argus® 2 except the starlight night vision, but at a much more affordable price (below $100). So if you need a cost-effective security solution that gets the job done, Reolink Argus® Pro could also be one of your top choices. 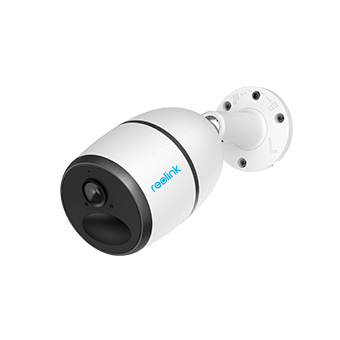 Operating on the 3G/4G LTE network, the cellular-based battery powered wireless security camera Reolink Go is designed to offer an ideal security solution for places without WiFi connection and power, such as your barns, farms, construction sites, vacation home, campsites, remote cabins, sheds, etc. Flexible powering options: It comes with a rechargeable battery and also offers you the option to add Reolink solar panel (requires separate purchase) to provide non-stop power. 4G/3G mobile network: This mobile battery operated wireless security camera can work independently without WiFi connection and power source. Starlight night vision: In virtue of the starlight image sensor, Reolink Go can present clearer and sharper images and videos with more visible details even in total darkness. Customize your own alerts: Besides the intelligent alerts (push notifications, emails, siren) you would receive upon motion detection, Reolink Go also allows you to record your own alert message. Watch the video shared by a test user of Reolink Go. •What’s the wireless range for the battery powered WiFi security cameras? To get a battery powered long range wireless security camera, you can consult the camera sellers about the WiFi distance and normally they would provide test results for your reference. Note that the actual signal strength of battery powered wireless outdoor security cameras also varies with your installation environment. For example, the mental buildings, walls and trees could greatly weaken the WiFi signals. So, before you install a battery powered wireless security camera system in a certain place, make sure the camera can receive stable wireless signal for optical performance. • What’s the battery life of the wireless security camera with battery backup? As with the WiFi distance, the battery life of wireless security cameras is variable, depending on your specific usages. Most battery powered wireless security cameras, like Reolink Argus® 2, would send you low battery notifications, so you don’t need to worry when to charge the batteries. And a solar panel backup is even better to provide non-stop juice for your camera. For the practical tips about how to extend the battery life of your wireless security cameras, please refer to this expert guide by our senior editor Olivia. • Where do the battery powered wireless security cameras store recorded videos? If you want to record motion detection videos onsite with no monthly subscription fees, the battery powered wireless IP security cameras with SD card (slot) would be the best bang of your bucks. On the other hand, cloud storage also come as a handy alternative in case you have enough budget and want to access the footage from anywhere. Reolink, for example, has launched its cloud service and offers free cloud beta plan for its consumers. Your battery powered outdoor and indoor wireless security cameras failed to connect to the WiFi? Try out these effective methods below to fix the problem. • Use another router or the hot spot from your mobile phone to test whether your battery wireless security camera can connect successfully. • Check the WiFi operating frequency of your battery powered wireless security camera and make sure you have chosen the right frequency band of your router. • Ensure your battery operated wireless security camera has sufficient power supply. • Reset your battery powered outdoor wireless security camera to the factory default. • Make sure the wireless security camera with battery backup is not placed too far from the router and kept away from possible signal interference. • Examine if you have entered the right password of your battery operated wireless outdoor security camera system. • Upgrade your battery powered wireless outdoor and indoor security camera to the latest firmware version. Of course, this post doesn’t cover everything you may expect from a battery powered wireless security camera, but will certainly guide you to buy a suitable battery powered security camera in your place, such as USA, UK, Canada, France, Australia, etc. If you have more questions about the battery operated WiFi security cameras, leave your comment below and we would love to help. This entry was posted in Buyer's Guide and tagged battery powered cameras, battery WiFi enabled cameras, battery wireless cameras, WiFi troubleshooting tips. I would like to mount the Riolink Argus 2 near a rental house that is not internet / WiFi connected. Is there a way to monitor this camera remotely? Hi there,thank you for reaching out. If you mount Reolink Argus 2 near your rental house where there is no Internet, you will be unable to stream the live feed remotely. But the camera can still record motion detection events onboard without Internet, and you can later play back the footage to keep informed of what happened. Or in case you need a camera that can allow you to watch live viewing remotely with no Interent/WiFi connected, you may stay tuned with our 3g/4g cellular security camera which is coming out soon. Plz let me know if you have any other questions. Definitely interested in the 3g/4g cellular security camera!!!! Please let me know when it becomes available. Hi there, thank you so much for your great interest in our new product. We’re so thrilled to inform you that Reolink Go is now in the pre-launch stage and you can check out more detailed information here: /lp/reolink-go/. And if you want to be the first to know when the Reolink Go is available, you may subscribe to us via the entry point included in the above link. Hello, my ideal solution is a totally wireless security camera that I can connect to my neighbours’ wi-fi (and they will connect to mine) so that even if my router is compromised, it will still work. That way, even a power cut will be ineffective, because I will still be able to get a notification and call the police. Is the Argus 2 capable of that? I think that if people started sharing their wi-fi connections for security purposes, home security would become much more practical, effective and economical. Hi, Mackie, yes, you can connect the battery powered wireless security camera Reolink Argus 2 to your neighbor’s WiFi. Note that if your neighbor’s router is compromised or a power cut happened in your neighbor’s house, you cannot get notifications from the Argus 2. But the camera is still capable to record motion detection videos onsite for your later review.